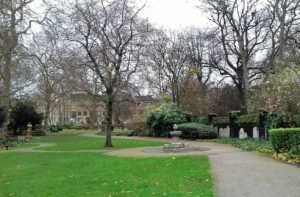 In my recent wanderings around central London I have found myself in two ‘gardens’ which were formerly burial grounds, attached or unattached to churches. Each was fascinating in its own way and I have found one connection, at least, between them. First, St Pancras Gardens. Attached to Old St Pancras church, this ancient burial site has featured in a number of literary works, including A Tale of Two Cities ( see Metamorphosis ) and it contains the Hardy tree. It also contains a number of monuments. Sir John Soane’s Grade I listed memorial still stands there, the famous architect and collector of antiquities whose house in Lincoln’s Inn Fields is such a treasure trove. He also designed Dulwich Picture Gallery ( see A South London Gem ) featuring a similar domed canopy which inspired Giles Gilbert Scott’s design of the ‘classic’ red telephone box. 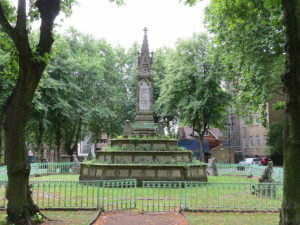 There is also the Burdett Coutts sundial memorial, a Grade II listed monument unveiled by Baroness Angela Burdett-Coutts, of the famous banking family, in 1879. At the time she was reputed to be the wealthiest woman in the world. I particularly liked the lions and dogs which sit at the four corners of the railed enclosure. The dog statues are supposedly modelled on Greyfriars Bobby, the famously faithful Edinburgh dog. 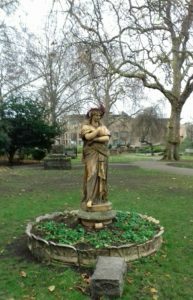 Last week to St George’s Gardens, less famous than St Pancras, but still having features of interest. 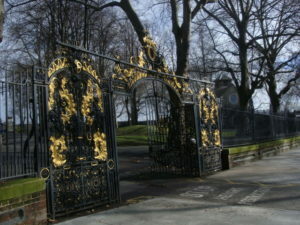 Established in 1713 as an additional burial ground for two Anglican churches whose graveyards were full, St Georges itself grew overcrowded and was closed in 1855. After disinterment and landscaping as gardens, it was opened to the public in 1890 by Princess Louise ( for the pub named after her, see A Perfectly Preserved Princess ). Some of the headstones can still be seen lining the edges of the gardens and some of the tombs are still in place. A terracotta statue, of Euterpe, the muse of music stands to one side half way in. On the day when we visited someone had made a wreath of browned leaves for her head. She originally stood on the facade of the Apollo Inn on Tottenham Court Road. Following the 1745 Rebellion a group of Jacobites, who had been hung, drawn and quartered, eventually found a resting place in the gardens. 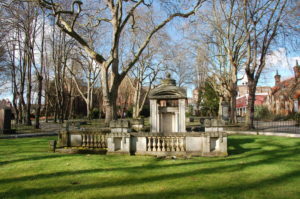 Their commanding officer, one Colonel Townely, was buried in the aforementioned St Pancras churchyard. So St Pancras was obviously considered more ‘respectable’ than St George’s in the mid-eighteenth century. There is also a connection between St George’s and Clapham, in that Zachary Macaulay, the antislavery activist, first Governor of Sierra Leone and long-time Clapham resident, is buried in St George’s, though it is not known where ( see Amazing Grace ). He and his son, Thomas Babington Macaulay are commemorated with a blue plaque on The Pavement, Clapham where they lived. This entry was posted in History, London, Nature Watch and tagged History, London, Nature, Worth a visit by juliej. Bookmark the permalink.